This wonderful one bedroom condo provides a quiet, secluded retreat for your vacation or business trip. Enjoy a queen size bed, large walk-in closet and a TV with DVD in the bedroom. The bathroom has a tub/shower combination with a Jack and Jill layout. The fully upgraded kitchen has everything you need including a breakfast bar with bar stools. There is a separate dining area, and a patio area off the living room. The living room offers cable TV with DVD and VCR and a decorative fireplace. We welcome your small dog. Please call the office for limitations. All pets must be approved at the time that you place your reservation. The Pet Fee is non refundable. This condo - as with all the others - is no smoking at any time. 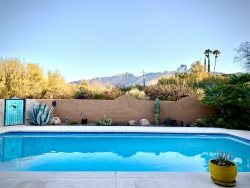 The gated community of Ventana Vista at Sabino Canyon offers a heated swimming pool, two spas, tennis courts, fitness center, club house and charcoal BBQ grills. You may enjoy all of the amenities during your stay! Walk or bike to Sabino Canyon in minutes. reservation for limitations and applicable fees.